It’s hard to get the best on the market, especially when you’re looking at devices with similar functions, and for basically the same purpose, right? 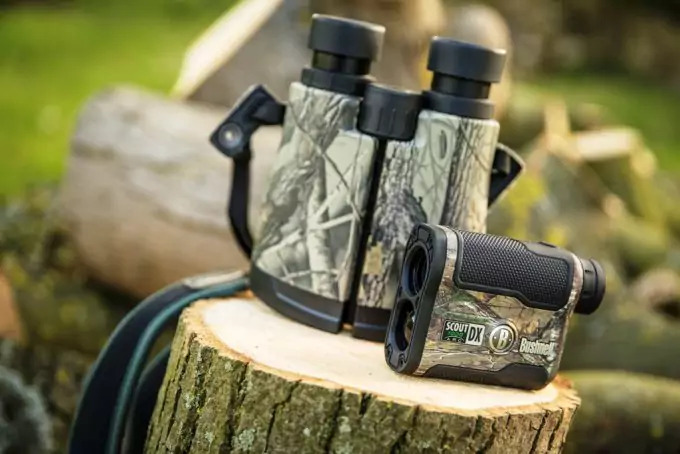 And it gets even tougher when you need the best rangefinder for your next hunting trip. But that’s why we’re here for, to help you out with our experience and research. We’ll start by analyzing some core elements you need to take into account before making your choice. After that, we’ll review some of the most awesome rangefinders on the market in terms of their pros and cons. All of that info is summarized in the table below so you can compare the products and make an efficient decision. Among the various things you should consider, some of the most important are the ones below. That’s because they’re all connected to your purpose for the rangefinder you’ll get. As such, there’s no bad rangefinder, there are only items that don’t suit your needs. The magnification and lens diameter tell you a lot about the rangefinder you’ll get. A bigger magnification entails more precise details at a further distance, so you can use your rangefinder for tinier animals. A smaller magnification may work for bigger animals or for golfing, though. The lens diameter tells you if the light transmission through the lens is qualitative enough. As such, the image will be brighter with minimal blurring. The maximum range explains at what distance your rangefinder will work. However, take into account that it’s not the same for all targets. While the maximum range is generally specified for reflective targets, like a bigger game, there will be a smaller range for trees or critters. But if your rangefinder has a good zoom, you can use that to enhance the smaller game. It’s also great if you can focus your device at a smaller range too, especially if you’re brush hunting. 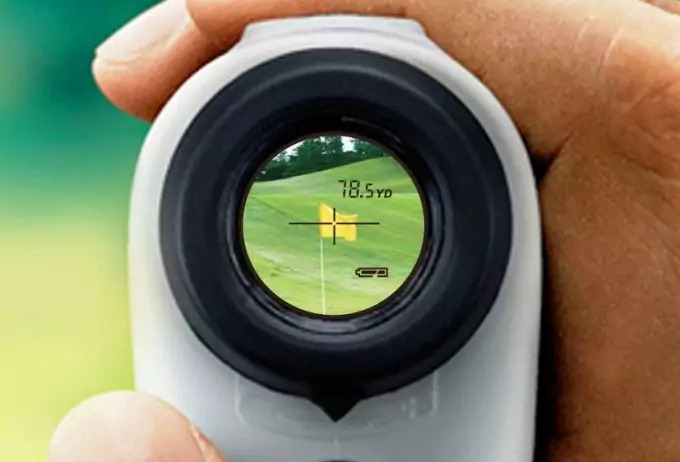 This might be a little tricky to find out for most rangefinders on the market because no one will tell you in their official specs that their rangefinder confuses trees for the game. On the other hand, they might specify that their rangefinder is better for golf, which takes place in open fields. 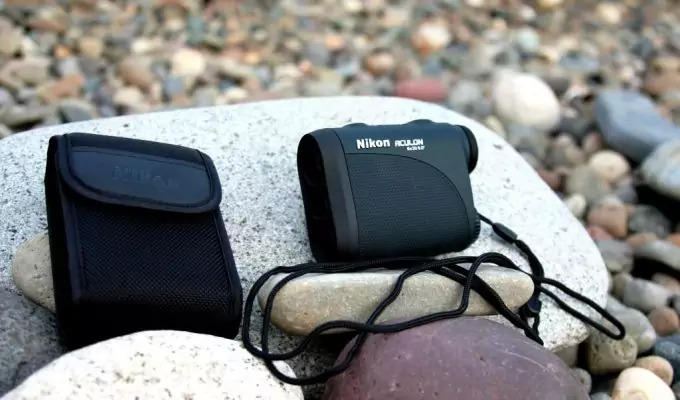 You need your rangefinder to work well even at dusk or dawn, particularly if you’re using it for hunting. You’ll notice the low light performance is connected to a smaller lens diameter. On the other hand, if the rangefinder you get has a good laser, that will enhance its effectiveness when it’s not full daylight. Just make sure the laser is still visible during the midday too. 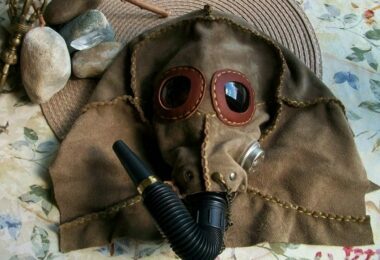 There are various modes to consider, each with its own role. The scan option is generally available for most rangefinders, allowing you to calculate the distance between you and various targets. We also like to see the target priority mode, which means your rangefinder can focus on a specific target. 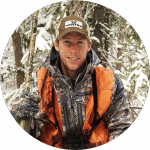 The angle compensation is great particularly for bow hunters, as the distance will be better estimated by taking elevation differences into account. Make sure you get a rangefinder that’s light enough to make it portable, but still heavy enough so it’s easy to keep it stable. Another option would be to mount it on a tripod for stability reasons. That’s good if you’re not moving around a lot, for instance when you’re doing target practice. You still need to check if that rangefinder has a tripod mounting capability, though. Among the materials used to get the best product available, make sure there’s a rubber armor for your rangefinder. A multi coated lens is great in terms of image brightness too. But most manufacturers will tell you if their products are resistant to rain or waterproof, maybe even fog proof or shock resistant. We’ve done our research and the rangefinders below are varied in terms of purpose, although they all have an affordable listing price. We’ve summarized and discussed the main characteristics for each one, and their pros and cons are listed below too. 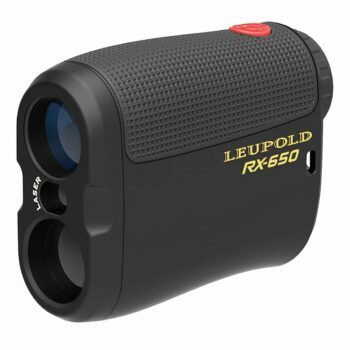 The Leupold RX-650 Rangefinder is the best rangefinder for the money thanks to its reduced price and quality construction. Its maximum distance is 650 yards, but that’s for reflective targets. If you’re brush hunting or hunting deer, that distance drops to about 575 yards. The black LCD display is clear, and we love its scan mode in terms of effectiveness. This will help you measure the distance between you and different animals at the same time, or follow just one that’s moving. On the other hand, we would have liked to see a target priority mode, or at the very least, an angle compensation mode. The single control button allows easy operation, though. The rubber housing is good in terms of grip and it makes this rangefinder waterproof. The 6x magnification is amazing for versatility purposes, and it’s pretty rare for a budget rangefinder. The fully multi coated optics are another plus regarding the image brightness. We think the 20 mm diameter is pretty small for great performance at low light conditions, though. Related: Since this rangefinder needs a CR2 3V battery to work, why not get a pack of three? The Viridian CR2 Lithium Battery has a 10 year shelf life, comes in a recyclable package and has the advantage of 30 percent more milliamps over similar batteries. The Bushnell G-Force DX Rangefinder offers the same 6x magnification that’s great for versatile hunting, up close or at further distances. However, we have the same complaint with the small 21mm diameter that might not work well for optimum light transmission in low light environments. On the other hand, the price increase is visible in certain features like the improved 1300 yards maximum range. Even the vertical range of 5 yards is good enough. And this rangefinder features an angle compensation arc, which is great for taking elevation into account. The laser used is class 1, and since it has a power output lower than 0.5 mW, it won’t drain your battery life fast. Plus, the illuminated red display is very bright which alleviates our fears regarding the low light performance. On the other hand, it’s impossible to see it during the day, even when it’s at maximum brightness. We love the rifle and bow modes available for maximum versatility, and the accurate measurements are given even when you’re brush hunting. The built in tripod mount is great for times when you need to hold this straight, and the rubber finish makes this durable and weather resistant. 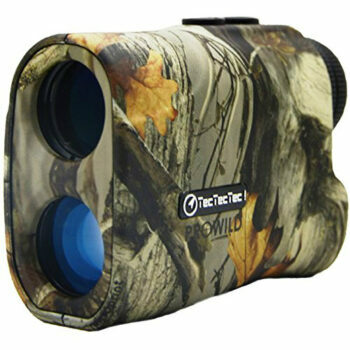 The TecTecTec ProWild Rangefinder is another budget rangefinder that’s great for hunting. The 6x magnification is on par with the other two rangefinders reviewed above, but the 24mm diameter is bigger. That would lead us to believe it works better in low light conditions, and it does, but reading the results is harder because the display isn’t illuminated. The maximum distance range you can get a readout is 540 yards, which is a considerable distance. On the other hand, you should point it a few times at your target to make sure you get the average. The continuous scan mode is a plus, but you also get the speed and hunt modes for increased precision. The housing is resistant to water and impacts, while the optics are multi coated and clear. This is a compact and light rangefinder, but it’s pretty hard to keep steady at a distance below 100 yards. The display is good, showing a distance and battery indicator. 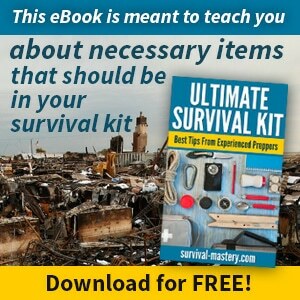 The package includes many useful things, like a carry bag, cleaning cloth, a CR2 battery, and a strap. Related: Since you’ll need more than the included battery to operate this gadget, why not get a 10 pack? The Duracell CR2 Ultra Battery might be just what you need. And it comes in a convenient pack, that’s easy to store and to use for other devices as well. 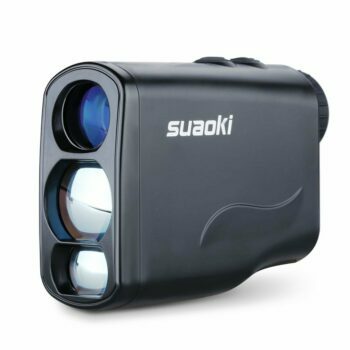 The Suaoki Digital Laser Rangefinder is the lightest in our rangefinder reviews so far. That makes it extremely portable if you’re to count the included carrying case and lanyard too. Regardless, you’ll find that such a low weight makes it difficult to keep steady. With its 6x magnification and adjustable focus, this is another device for versatile shooting. 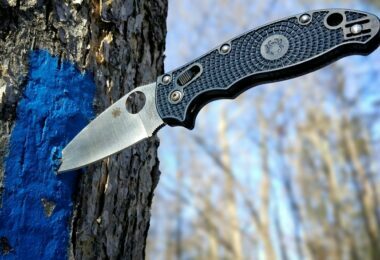 But this one is more appropriate for golf, rather than hunting because it might not perform well in the brush, where you’ll get readouts of trees. The range varies between 4.4 and 656 yards, which is another argument for its versatility. The 1 yard accuracy is a strong point, but we love its adaptable modes most of all. And with the user personalization feature, you can hide the ones you don’t need. As such, you’ll have a flagpole and distance correction for golf. The fog mode makes it great for difficult weather, but you’ll also be able to get a horizontal and height mode. The range and speed modes are also appropriate for different range finding, whether measuring the distance or keeping track of a certain animal. Related: If you’re into golf, but you’re tired of constantly picking your ball up, you might be interested in the PrideSports Golf Ball Pick Up. It’s great since you won’t have to constantly bend over to recover your golf balls, but it only works on round grips. The Redfield Raider 600A Rangefinder is a great gadget for zeroing your weapon, so you can get the exact target. That makes it very easy to include the viewing angle in the actual distance calculation. 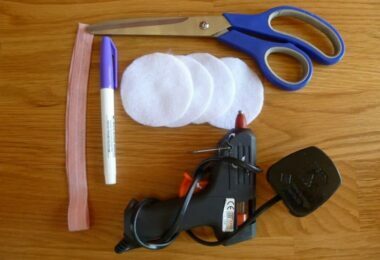 And we love the simple use with the one button operation. This rangefinder can also double as a scope thanks to the 6x magnification that’s big enough for you to see where the shot placement is. The range at which you can use this scope for varies between 5 and 600 yards, but the field of view is very narrow at just 6ᵒ. Another possible disadvantage can be posed by its reduced weight since you’ll have some troubles keeping it steady. However, it’s easy enough to handle it. The digital processor is very fast and the built in laser is powerful. The adjustable focus is another plus. But when you’re trying to focus the image, the display might become blurry, so you won’t get a perfect readout. 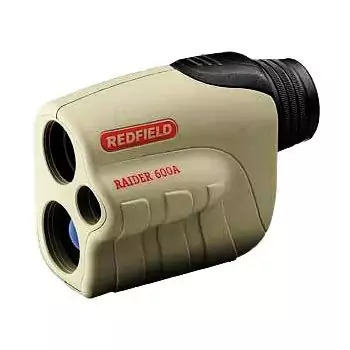 Related: Another light and compact version from the same brand, the Redfield Raider 650A Rangefinder allows you to calculate distances to a maximum range of 650 yards. It has the same 6x, and it’s fully multi coated for optimum image brightness, but the reticle is more difficult to distinguish in low light environments. 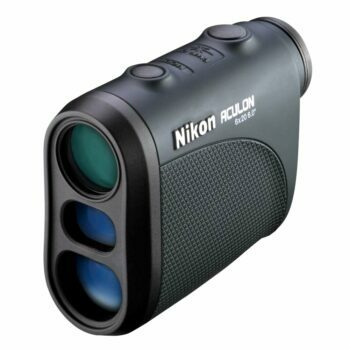 The Nikon Aculon Rangefinder is one top notch product that features a class 1 laser, with a power output of below 0.09 milliwatts. That relates to a long battery life so you won’t face the hassle of constantly replacing it. The 6 – 550 yards range is great too, so you can use it for bow hunting or target practice. The 1 yard increment displays help with that too. The LCD display is easy to read, and we appreciate the long 16.7 mm eye relief. 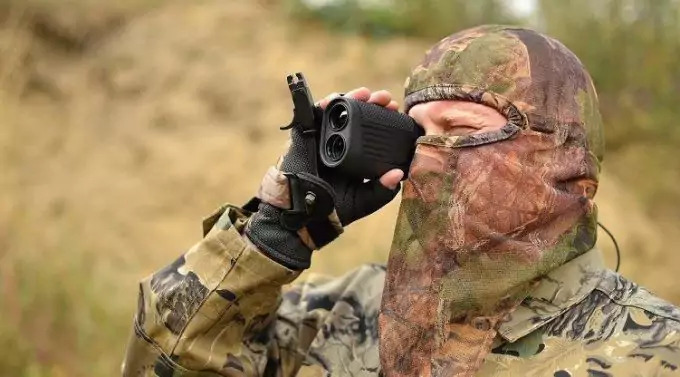 There’s a distant target priority mode too, which makes this rangefinder better for long distance shooting even when you’re surrounded by brush. However, with its weight so small you might find it hard to keep steady. But you can wear it in your pocket, or even on a lanyard around your neck. The rainproof housing is great for use in rough weather conditions, the multicoating makes the image clear since there’ll be a minimal light reflection, and the 6x renders it a versatile rangefinder. However, the 20 mm lens diameter might not work great in low light circumstances. Related: If you’re bringing your pets along on your hiking or hunting trips, you might need the Whistle 3 GPS Pet Tracker. This will tell you exactly where they are, but it’ll let you know exactly the moment they leave their designated space. 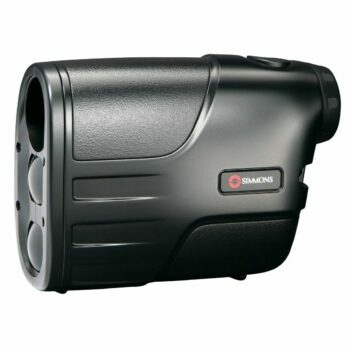 The Simmons 801405 Rangefinder is a good rangefinder, with a 4x magnification that allows you to see increased details. The 20 mm lens diameter isn’t that good for low light conditions when it’s hard to see both the target and the displayed reading. The 5 – 600 yards range is generous enough for various activities, including hunting or golfing. However, even if this rangefinder has a 1 yard accuracy, you’ll still need to use it in open spaces. That’s because it can’t range anything through the brush. With its one button operation, this rangefinder is easy to use. The laser is great, it’s a class 1 type and the average power output is less than 1 mW. That, along with the liquid crystal display is great in terms of accuracy, and the display is sharp if the light’s good. On the other hand, we would have appreciated a zoom option. The reason is you can’t see smaller animals at a bigger distance. In fact, the maximum distance for furry animals is just 200 yards. 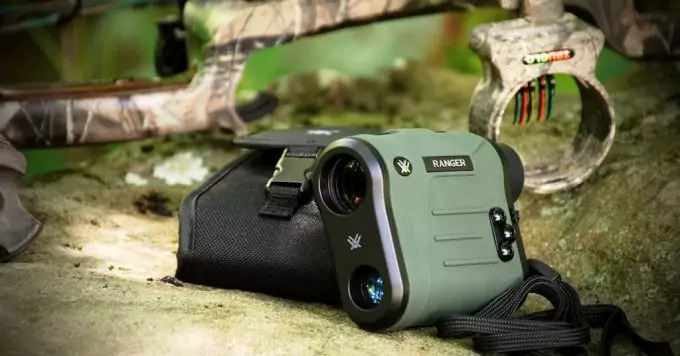 The Wildgame Innovations Halo Rangefinder is great for bow hunting. With its 6x magnification, you can get minute details at a considerable distance, and the 600 yards maximum for a reflective target is a good distance. We love the scan mode that’s good for constantly ranging and calculating the distances to various targets. The 1 yard precision renders it fairly accurate, as does the elevation change. This is a user friendly device that offers both yards and meters calculations, and people who wear eyeglasses can keep them on. The water resistant housing makes it safe to use even when it’s pouring. On the other hand, the optics could be better. The images can get a bit blurry around their edges, and the focus is somewhat difficult to maintain. It’s also not the perfect device for low light conditions. Related: The Wildgame Terra 8 Trail Camera is in the inexpensive price range as well. This trail camera offers a detection range of 60 feet, and it’s very fast. You can use it to record images and videos both during the day and night on a maximum 32 GB SD card. What Will You Decide On? 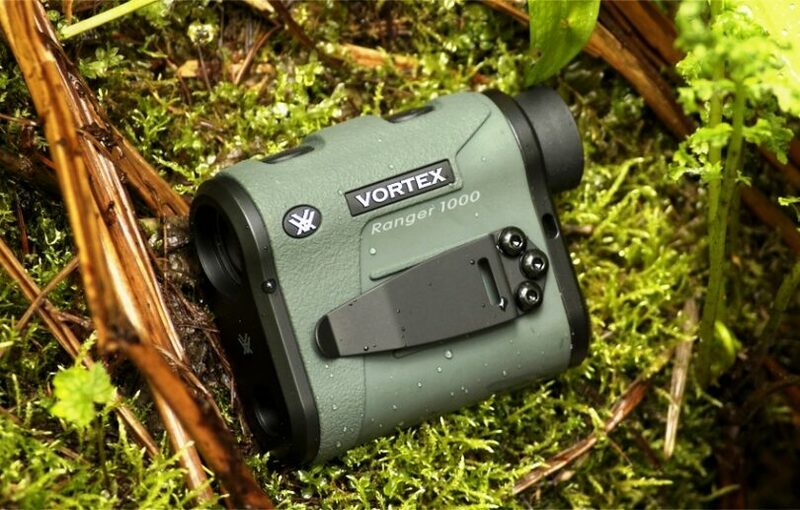 We’ve discussed various top rangefinders here. 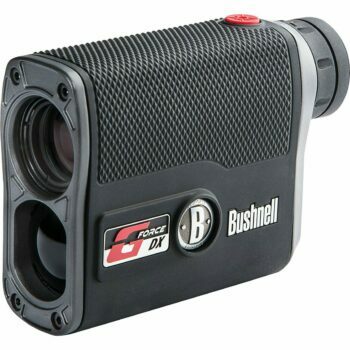 Some, like the Bushnell G-Force DX ARC, are versatile devices, while others have a targeted use like the Suaoki Digital Laser Rangefinder, which is great for golf. With all the different dimensions and various characteristics, some devices work better in open fields, at an increased distance, while others are more appropriate for brush hunting. With that said, let us know what you’ll choose. What are you going to use this rangefinder for? 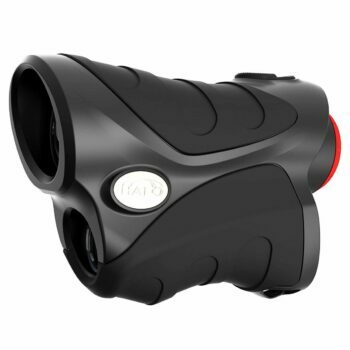 Would you like to add to our list with a good rangefinder you know of? The comments are right below.